METAL PULP AND PAPER: Hello Diane. Thank you for taking the time to answer some questions for Metal Pulp And Paper’s feature called Behind The Lens. We appreciate it. Before we go any further, let’s first tell everyone what Behind The Lens is all about. This feature is about the person that’s behind the camera lens. All about that individual that captures that perfect fiery orange of the setting sun, finds a child jumping in a mud puddle in the pouring rain, or catches the moons glow in the water next to some snowcapped mountains. Or captures the rock guitarist jumping in the air during mid solo. It’s about finding that beauty in something that some might not take notice of in their everyday busy lifestyles. Behind The Lens will be a way to get to know a little more about the photographer and the work that they bring to everyone. A full 360 degrees around the camera. So, let’s take off the lens cap, and go behind the click of the shutter and get to know more about you and your photography, shall we? How long have you been a photographer and taking pictures? DIANE WEBB: I’ve been a photographer for as long as I can remember! Since I first held a camera I’ve been fascinated with taking photos. My earliest cameras were polaroid’s, the odd 110 film cameras and then moving up into the rolls of 35mm then into the digital age. I’ve always been a hobbyist until about 4 years ago when I realized I was always taking photos of everything whether with my phone or a camera and I just fell into going professional out of my love for capturing images through the lens. MPAP: What first drew you to it? Was there an inspiration for picking up the camera and beginning that journey into the art of photography? DIANE: I can’t say that there was one particular thing that drew me to photography. I guess for me it’s always been trying to see things from a different perspective or angle other than how most people just look at things as they are without looking any deeper. MPAP: Now that you’ve been doing it for a while, what interests you the most about it? Is there a passion behind it for you at all? DIANE: That old phrase, 'A picture is worth a thousand words.' I believe one photo can say so many things to the viewer and can actually pass on emotion to them as well. I love to capture the emotion in what I am shooting, and have it pass through my photos. I’ve been told many times before by subjects and people who’ve seen my work, that they felt such an emotional connection in how I shot the photos, that they can look at the photos and feel as if they were there. MPAP: Can you describe that moment, the experience, or even the emotion you felt when you knew that photography was something you just had to do? DIANE: I was in high school and I saw water dripping from a walkway cover and had a camera with me and in that moment, I had this urge to capture the way the drops hit the ground and how they splashed as they did. I’ve always looked at things in a view of, there’s more to that than we see. MPAP: What do you like to photograph the most of? Do you have a favorite setting, scene, landscape, or any items that you like to capture? Or do you like to just take pictures of people, or perhaps a live music concert now and then? DIANE: I like to photograph live music the most, my favorites are theatrical bands with all the makeup, smoke, lighting.. the insanity of those shows looks amazing on camera. But as a photographer, I shoot anything that grabs my attention. MPAP: Is there anything out there that you try to avoid taking pictures of? DIANE: Boring, limited types of photos. I like to be able to be creative and capture what catches my interest. MPAP: When picking up the camera, it obviously took some time, along with some practice, to get the feel and hang of it of what you wanted to do or go with it? Maybe even a class or two was taken to learn more about it. Tell us what were some of the challenges you’ve encountered with taking pictures? What have been some of the difficulties you’ve experienced since first began, and maybe still happens to this day? DIANE: Lighting, it’s always lighting. Being that my main work is in event photography, mostly music, the biggest challenge is always negotiating the lighting conditions that are constantly changing. Learning how to shoot completely in manual and how to quickly adjust settings has been something I’ve had to learn. You also need to shoot frequently so that you don’t lose the skills you’ve gained because if you don’t use them often enough, you do lose them. MPAP: On the other side of it having some difficulties, what are some of your favorite things about being a photographer you can tell us about? What have been some of your camera highlights so far that you can share with us also? DIANE: The opportunities I’ve had. I’ve been able to work with artists I’d never dreamed about. I’ve been able to travel and cover live events around the world where I also have time to shoot other subjects besides music. I’ve also made some pretty amazing friends in the photography community along the way and we are always sharing tips and tricks. MPAP: When someone sees the picture you’ve taken for the first time, whether it’s the new bride and groom, or a family member that just had a baby, what do you want someone to get out of it? Is there ever anything you’re trying to say within your pictures, a message deep in the pixels that makes it up? DIANE: I want them to feel the emotion of the moment in the photo. There’s no message other than, feel something. MPAP: Is there an artist or another photographer out there that you admire and might have influenced you at all? What about their work do you love the most? DIANE: I can’t really say that I admire any photographers. We all shoot what we love and have passion for. We can be standing shoulder to shoulder taking the same exact shot at the same exact moment and be focused on something different in the shot and have completely different photos. I admire shots that catch my eye or make me feel something over admiring who took the shot. The truth is, the work we do is what is admired, not us. MPAP: Before we move on to talking about the pictures that you shared with us, are there any tips or advice that you would want to give yourself if you had to pick up the camera and start photography all over again? DIANE: Talk to everyone who’s in photography. You will gain many friends with the same passions, folks to shoot along with, friends who will give you tips, some who will mentor you as well. Give back as you grow to those who are just starting out too. Shoot often! The only way you really get any better is to be out there shooting something. Don’t be afraid to ask people to look at your work and give you constructive feedback on what they see and what you could do differently. While there are some folks who are just plain jerks and will have nothing at all to offer you, most will have many great insights to help you grow your skills. MPAP: Now on to the pictures that you took and have shared with us here? Take us into each one of the pictures and tell us what they are about, and which one is your most favorite and why? 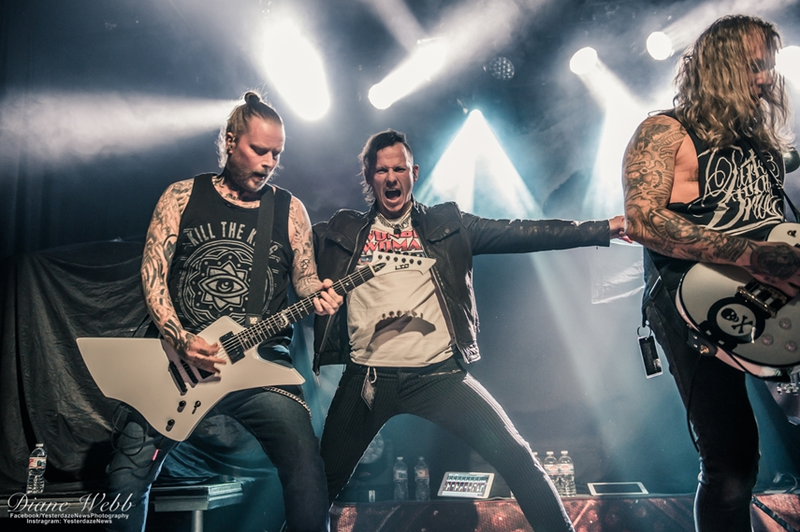 Cyhra: I loved working with this band on their first USA tour. It was a unique opportunity to see and document their first experience here. 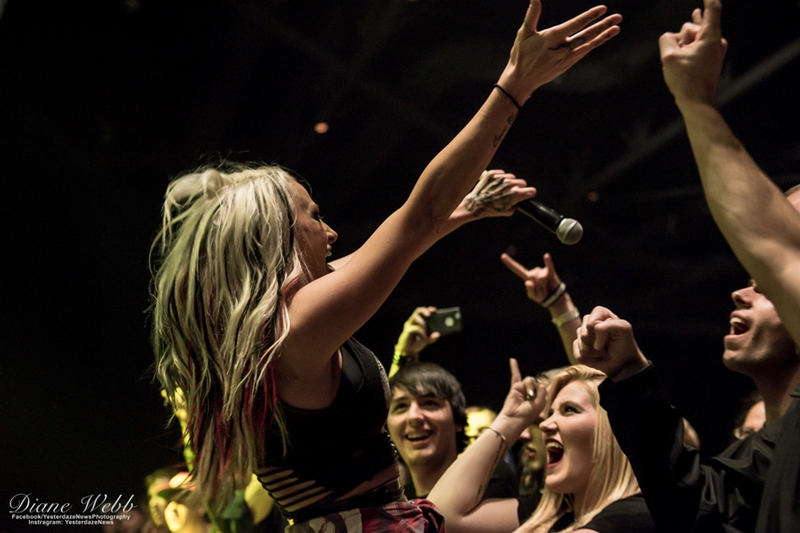 Butcher Babies: To me, this photo pulls in that emotion between an artist and their fans. The very reason I love documenting live music. Heidi loved this shot and said, "This is why she does her art". I love these moments. 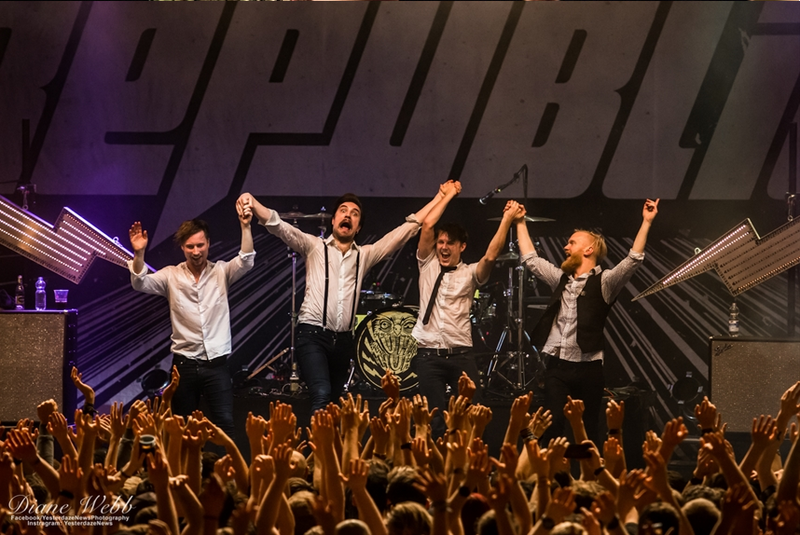 Royal Republic: I came across this band from Sweden at Sweden Rock Festival one year and they have such an infectious live show. I had the opportunity to shoot them live in Germany a few years later and this shot just pulls the energy they give along with the fans arms up in the air. 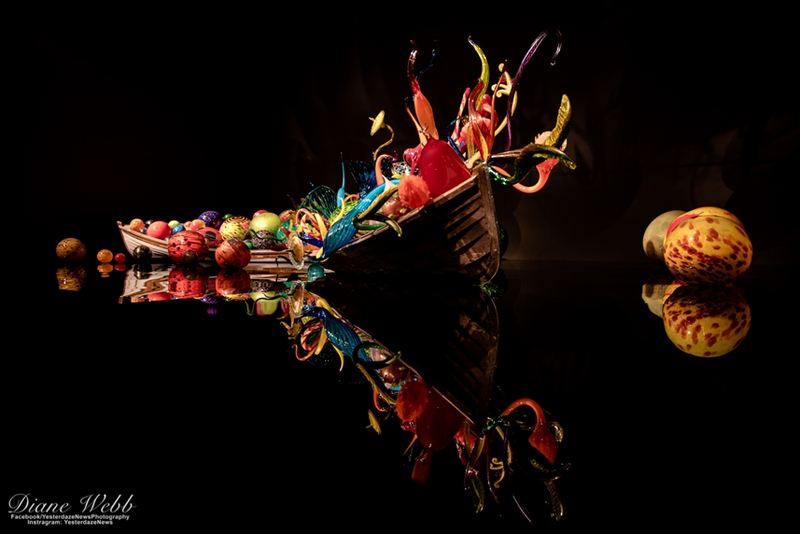 Chihuly: I like to take photos out of music too. I love the colors and contrast in this shot. 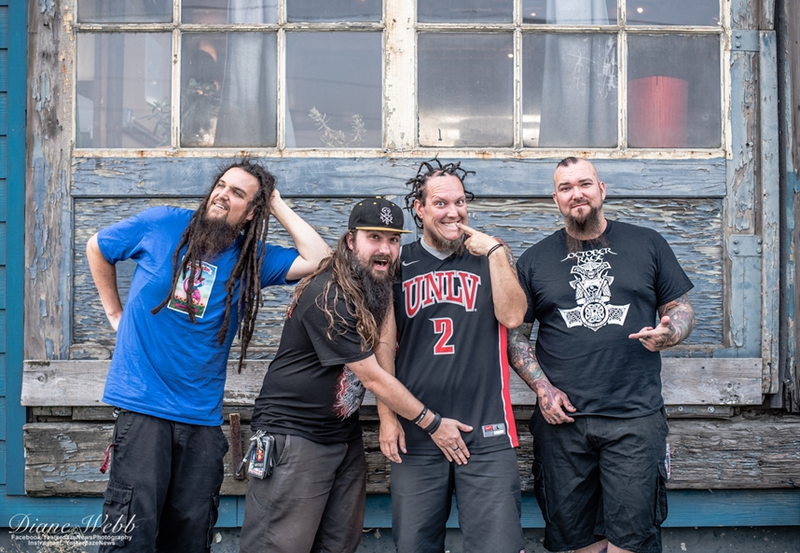 Hemlock: I've worked with these guys a few times and have become good friends with them. We did a few promo shots last summer while they were out on tour and I love working with them. It's great when you have that trust and comfort working with artists and they can cut loose with you. 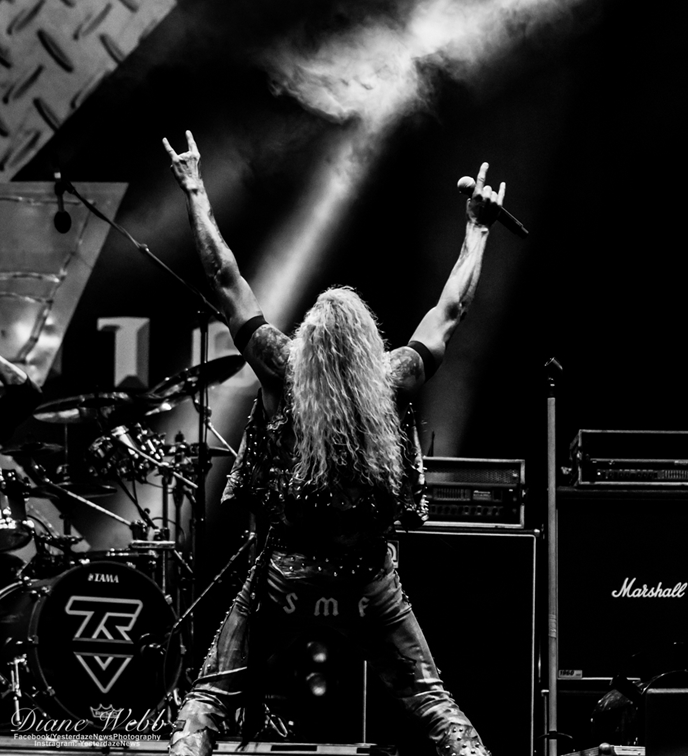 Twisted Sister: This is a shot from their last ever show in Sweden. I love the feel of this photo, the arms up high and that feeling of, this is what rock music is. I am so glad I had the opportunity to document this performance. MPAP: Those are some great pictures. Thank you for sharing them with us. Everyone has a different style or taste, whether it’s street photography, modeling, black & white, or nature, from your point of view what do you think makes a good picture? DIANE: Being able to draw your viewer into the photo. Something in the photo has to get them to take a deeper look. After that, it’s up to them to decide how to interpret what they are looking at. MPAP: After the camera is put down for the moment, for the day, or for the night, whether it’s for a day or a week at a time, what else do you like to do in your free time? DIANE: Free time, what is that? Lol… I shoot lots of live shows, write, run a music website and digital magazine. I spend time with my family, travel, and dream disconnecting with the world and soaking up nature. MPAP: Before we bring Behind The Lens to a close, just one last question and we’ll wrap things up and put the lens cap back on. What would you want to say to someone that’s interested in taking pictures for the very first time? DIANE: Learn about aperture, ISO and shutter speeds a little before you start shooting. Learn to shoot in manual from the beginning and something often overlooked, learn how to compose a photo, it’s not only the camera settings a photographer needs to be fluent in, knowing how to create and capture a great photo go hand in hand. MPAP: On behalf of myself and Metal Pulp And Paper, I’d like to thank you, Diane, for being a part of this Behind The Lens feature. It was great getting to know you and your photos. We look forward to seeing what you will capture in the future and beyond. Please tell us where we can find your work or your photo galleries on the internet, and any social media that the readers can follow you on? MPAP: Once again, thank you.